Bell’s Palsy is a condition involving a lesion (damage or wounded) of the facial nerve number 7. This results in flaccid paralysis (weakness or reduced muscle tone) of the muscles used for facial expression on the same side of the damaged or wounded nerve. This weakness causes one side of the face to droop. The nerve damage may affect your sense of taste and how you make saliva and tears. The causes of Bell’s Palsy are not entirely understood but some scientists believe a viral or common cold sore virus may contribute to Bell’s Palsy. Facial muscles that are swollen or inflamed or compressed may compress the facial nerve causing Bell’s Palsy (these compressed or swollen muscles can occur by a blow to the face but could be of unknown origin). Exposure to a chill or draft while sleeping may contribute to Bell’s Palsy. While it is true that Bell’s Palsy can clear up on its own within several months, some may develop permanent muscle weakness. 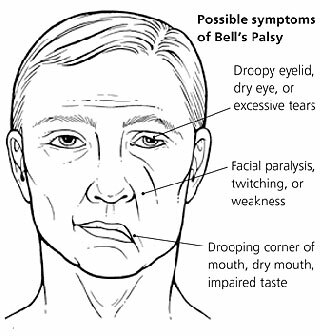 Treatment for Bell’s Palsy would focus on reducing any inflammation/swelling or compression of the facial nerve. Treatment with physiotherapy, acupuncture and massage can help reduce symptoms and treatment would focus on the muscles of facial expression. 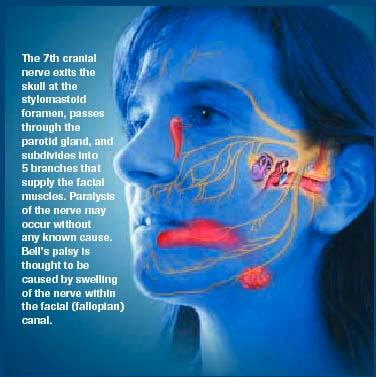 If you have any questions about Bell’s Palsy contact our staff at Dynamic Physiotherapy. Do you take WSIB patients? Yes, WSIB will pay for approved physiotherapy treatment for workplace injuries. Some WSIB injuries are covered for up to 12 weeks.